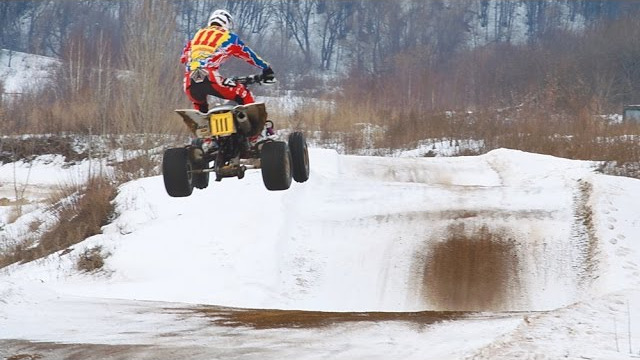 Roman Khorev, the 2013 Russian quad cross champion, lives and trains in Podolsk. One of the stages of the championship of Russia was held in Moscow, so we managed to attend the training session of Roman and see how he prepares for the competition. The track in Pechatniki is extensive, with a lot of jumps. Icy areas and snow significantly complicate riding because of a bad, unpredictable traction, so it always makes sense to ride it beforehand. Roman does rides for 25-30 minutes. It is unreal to drive longer due to the fact that he gets arm pump. When driving a quad, a lot of weight falls on your arms. Professionals quickly recover between races, but they reach the finish line with their last bit of strength! We recorded Roman's training sessions from different angles, so you can see interesting sections and professional riding on the track!